When Gwen Cox raised broiler chickens for Pilgrim’s Pride from 2001 to 2004, she had to use poultry feed provided by the company. After a few incidents when she felt physically ill working with it—“I would start coughing and could hardly stop, or I’d get lightheaded or nauseous,” she remembers—she checked the feed labels and noticed that they listed roxarsone, an organic arsenic compound, as an ingredient. Concerned about her chickens as well as her own health, she asked Pilgrim’s Pride why she was being forced to use feed containing arsenic. Roxarsone doesn’t disappear once chickens eat it. Some is distributed throughout the animal’s tissues, including the breasts, thighs and legs—meat that is later eaten by consumers. The rest is excreted unchanged in poultry waste. Ninety percent of this manure is later converted into fertilizer that can contaminate crops, lakes, rivers, and eventually drinking water. Little research, however, has investigated the public health consequences of this practice, which was banned in the European Union in 1999. Although several studies have looked at the levels of arsenic present in chicken muscle meat, and some have looked at crop soil contamination, the results have been inconsistent. None have determined how extensively this practice contaminates drinking water. “There’s been such a huge degree of regulatory attention paid to arsenic in drinking water, and yet here’s this very widespread practice that has a real potential of adding to drinking water contamination and yet nobody’s looking at it,” says Dr. David Wallinga, director of the Food and Health Program at the Institute for Agriculture and Trade Policy (IATP), a non-profit research and advocacy organization based in Minneapolis. Any increase in Americans’ levels of arsenic exposure is of great concern: The Environmental Protection Agency, which regulates drinking water, considers arsenic a class A carcinogen, meaning that data have definitively shown it to cause cancer. Other health effects from chronic low-level exposure include partial paralysis, blindness and diabetes. Although the EPA tightened its regulations for arsenic levels in drinking water this past January, lowering it from a maximum of 50 parts per billion (ppb) to 10 ppb, this new level still exceeds the agency’s recommendations for exposure to a carcinogen by a factor of 50. The EPA typically recommends that the amount of a carcinogen in drinking water should not cause more than one person in 100,000 to develop cancer as a result of drinking that water daily. But Americans who are regularly drinking water containing 10 ppb of arsenic are at a 50-fold higher cancer risk than this: in other words, one out of every 2,000 of those Americans is likely to develop cancer because of the arsenic in their tap water. And the EPA estimates that 12 million Americans are currently drinking water containing more than 10 ppb of arsenic—making their cancer risk even higher. The EPA isn’t meeting its own safety standard for arsenic because the recommended amounts “are set at a level which water systems cannot meet,” according to agency press officer Dale Kemery. After preparing a cost / benefit analysis, the EPA set its arsenic limits at a level that maximized risk reduction while minimizing cost to the consumer, he says. Where is all of this arsenic coming from? Most arsenic contamination arises from natural sources or from its former use in pesticides and wood preservatives. Though these uses have since been banned, the arsenic remains in the environment and is extremely difficult to remove. 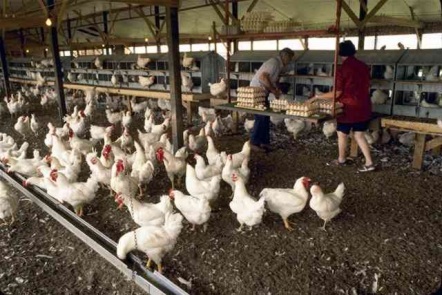 The poultry industry’s use of roxarsone, however, is one of the few easily preventable ways in which arsenic enters the food chain. Given that arsenic is already a significant health risk, many think that its use in poultry feed should be investigated and, if found to be a significant source of contamination, banned. Thank you, Melinda, for exposing this issue. It’s important for Joe Q. Public to realize the crap that is put into the food chain by the big agri-corporations, that no one- especially those who grow animals for them- can seeingly do anything to stop. In the name of saving money or getting more out of each bird, they will do whatever they feel it takes… and ignore any health or environmental problems their actions may cause. Melinda, the broilers group cannot afford to support what you are saying because of possibly being frowned upon by the integrator, or at least that is the perception. Aside from the sensationist beginning, we have to sell papers don’t we? :-), I thought the the article was good and should be helpful to growers in the long run. Thanks for your time. Thank you for highlighting this important problem. I did want to clarify one minor point: Our March 2006 study where we tested fast food and retail chicken for arsenic was, in fact, reviewed for accuracy by independent scientists. They are acknowledged. We just did not publish the study in a scientific journal, opting to publish it ourselves to get the information out more quickly. Thanks for clarifying that point, and I apologize for the mistake. Hey- don’t punish the growers by not buying chicken. They already have it hard enough! Write, call, or email the big companies such as Sanderson Farms, Tyson, and Pilgrim’s Pride and demand a less hazardous to your health product. Even if you don’t eat these birds, the arsenic is still finding it’s way into our environment. In 2002, a peer-reviewed study documented high levels of arsenic in 6 of 10 autistic patients compared to controls. (1) Toxic metals have no place as food additives or as “fertilizer”. 1. Lonsdale D et al. Treatment of autism spectrum children with thiamine tetrahydrofurfuryl disulfide: a pilot study. Neuro Endocrinol Lett. 2002 Aug;23(4):303-8. Never in the history of this nation has an industry been more in need of government regualtion! The competition is such that even concerned integrators cannot make the neccesary improvements! Rather than giving up eating chicken, it is a better idea to purchase organically grown chicken from a local farmer. I rarely shop at the “regular” grocery store now, opting to raise some of my family’s food, shop at a small organic grocery, order once a month from a buying club, and purchase food directly from farmers in my county. It takes some planning, but we are eating very well and we are very healthy and thrilled with the quality of the food. Thanks for your comments Kimberly. Rather than not eating chicken, support organic producers. My family does the same. Sends two messages. it supports people who are doing it right now, and forces the other producers to look at their practices if they are losing sales. In previous years, I purchased free range chicken from the health food stores I frequent. Rarely can I buy organic chickens. I noticed the fat is a different color than the fat from conventional growers, and could not find anything about whether or not poultry contained arsenic. However, whenever I eat poultry, regardless of the source, the neuropathy in my fingers worsens. While I cannot prove what I say, I believe it is from the allowable arsenic that the U.S. FDA allows farmers to give poultry (and other animals) to treat for parasites. While visiting China in 2005, I learned that the Chinese do not give poultry arsenic. If that were the case, why did my fingers hurt everywhere I went and regardless of what I consumed? I suspect the reason was that everywhere in China, the people and industries burn coal. The people use coal briquets for cooking and heating their homes. The air, soils, water, and groundwater, as well as the seafood, is not only contaminated with arsenic from the burning of coal, trash, agricultural wastes –but mercury and other toxic metals and chemicals prevail everywhere, even along the Great China wall. I’ve basically stopped consuming most meat, choosing to eat low on the food chain, instead. Although, arsenic may not bioaccumulate like mercury, it is wide spread in our environment and the environment of other countries due to the burning of fossil fuels. The levels of arsenic in our drinking water are out dated and President Bush has given only lipservice about strengthening them. He through various affected industries have dismantled the studies at the Mid-West library of the US EPA. Studies that once set regulations to better protect public health. And, through those who fund the campaigns of the Greedy Ole Party, he has all but eliminated the Environmental Protection Agency. The U.S. EPA is flying blind in trying to protect public health or the environment. Even the chemical industries which manufacture chemical warfare agricultural pesticides and other toxic chemicals, are regulating themselves. There is no environmental protection in the U.S.A. any longer. I completely agree that organic chicken is much better than commercially grown, but once again- even if we don’t eat arsenic laced chicken grown by a mainstream producer, the arsenic levels will continue to filter out into the environment as the arsenic filled by-products (poop, bedding, excreted feed, etc) are spread on the fields or wash into water supplies. We are STILL eating the stuff, just not directly. We need to get the big companies to stop using arsenic. They stopped using certain antibiotics and hormones, and sure can stop this as well. Don’t forget that the growers can not do anything to stop this. They are only allowed to do as the company tells them to. Reading about how arsenic can contaminate the drinking water makes me think of what else could be sneaking into my body by what I drink or eat. To RockMonkey, who said s/he’d stick to tuna…. Don’t do that. There’s load of mercury in tuna. Especially certain kinds. You can read about it in my article for Mothering Magazine, here. That’s true, Jennifer, I had forgotten about that. Thanks for link! And let’s not forget PCBs, which can build up in the fat of some fish. Okay, there’s mad cow in the beef, mercury in the fish, E. Coli in the veggies and pesticides in the fruit. And now there’s arsenic in the chicken! You might as well not eat anything if you don’t want to take risks. Arsenic was also in pressure treated lumber that is used for many kids playgrounds. My daughter was mercury poisoned by receiving 3 adult flu shots as an infant (in 8 weeks)..and 2 of the 3 were adult doses. She received 25 times higher dose of ethylmercury than the EPA max for her weight on 2 of the 3 occasions..one occasion was 12.5 times higher. After the 3rd flu shot she wouldn’t resond to her name (within hours), lost her speech, lost her eye contact etc.. It took her 9 months to start talking again. No one told us about chelation..six months after her heavy metal toxicity we used mild, all natural chelation under MD supervision. Surprisingly..her hair analysis (shows what metals are being excreted) was high for arsenic as well as mercury. We stopped playing on pressure treated lumber playgrounds. Our well water was under the standard for arsenic. Maybe she was getting some from chicken..though we are pretty consistent about only buying organic produce and meats. Thanks for bringing this to our attention. I don’t trust the EPA, CDC or FDA after what happened to our daughter..I am sure the additive to the feed containing arsenic is used because it is a cheap way to prevent the parasite..there must be a better way. Thanks.. This is exactly why I prefer Canine over chicken meat. And it tastes like chicken!!!! so if they’re feeding chickens Roxarsone to get rid of parasites and to make the chickens grow bigger, and then we’re eating them with traces of Roxarsone in them, could that possibly be one of the reasons why people are getting fatter?? would it not effect us in the same way? food. Iw stop eating a lot of meat I wonder how that would affec the meat industry.. We all should become veggans. How do you like them cherries? For the person who wrote that they will stick with eating tuna, recently it was suggested that one eats no more than two servings per month due to such high levels of mercury found in tuna. What is safe to eat today? That is why I went veggan a long time ago! The mad cow was enough for me! ..i raise chickens I notice last week when I read the ingredients for chick starter feed I noticed that one of the ingredients was poultry by products! Whew!! I’m feeding my baby chicks dead chickens! shades of mad chicken…..but I will be looking into this arsnic additive. will my chickens eat my blueberry fruit? I have always loved chicken but in 1993 I developed a bad case of chronic migraines. I went to doctor after doctor only to be given higher and higher doses of medications and soon became a zombie. After 14 years of suffering from headaches, nausea and flu like symptoms a friend came to me and took everything out of my diet including chicken. We slowly added foods into my diet and found that I can’t eat chicken or eggs. I have been migraine/headache free for the last 2 years except for a few times when eggs were in a product that I missed or forgot to read on the label. I am not sure what has happened to the chicken or the egg, but I can no longer eat them without becoming seriously ill. I am not writing this to frighten people in any way, I just wonder how many people out there suffer from the same symptoms and have not connected it to eating chickens and their eggs.